In the world of conventions and trade shows, large food and restaurant events always rank near the top in terms of fun, excitement and the opportunity to sample new and interesting foods and food service products. If you’re thinking about attending or exhibiting at a food-related convention, you don’t want to miss these captivating shows! The United Fresh Expo and Conference serves as the annual highlight for the fresh produce industry, showcasing new produce items, fresh food trends, tools and technologies to industry professionals. It brings together the entire fresh produce supply chain, from grower to retailer, giving exhibitors and attendees a unique opportunity to develop new partnerships that improve sales and profitability. The expo connects exhibitors with leading executives in management operations, fresh-cut processing, food safety and quality control, operations and production, IT management systems and more, with 70% having business decision and buying authority. The food retailer’s premier event, FMI Connect provides industry professionals with the products, partnerships and professional development they need to advance their careers, stay ahead of their customers’ changing tastes, and increase their company’s profitability. Exhibitors can display their wares to the largest and highest-quality audience in the food retail and wholesale industry, including more than 12,500 potential buyers, of which three-fourths are management level or higher. As America’s largest specialty food and beverage show, the Summer Fancy Food Show draws more than 46,000 industry professionals to one event for three days of showcasing the next big products, trends and companies. With more than 25,000 buyers in attendance, it provides exhibitors with a convenient and cost-effective opportunity to connect with decision-makers from every major food and beverage buying channel in the United States and around the globe. Only Specialty Food Association members are allowed to exhibit at this show. The most important trade show of the year for food science professionals, IFT is a global event that brings together the brightest minds in industry, government, and academia for four days of learning, networking, and problem-solving. Exhibitors have an opportunity to showcase their new ideas, products, and solutions with senior-level executives and qualified buyers from around the globe. Eighty-six percent of IFT Food Expo attendees make or influence their companies' buying decisions. Sixty-eight percent say they attend to seek out new products and solutions, while half attend to find new suppliers. Presented by the School Nutrition Association, SNA’s 70th annual national conference is expected to attract more than 6,500 school nutrition professionals and industry members to the nation’s premier school nutrition event to see the latest and greatest in food, beverage, supply equipment, and service solutions. An ideal exhibiting opportunity for companies with a focus on K-12 school nutrition operations, ANC puts them in direct contact with school nutrition directors, managers, employees, and other important decision-makers in this specialty segment. The annual event for the American Association of Diabetes Educators, AADE gathers 3,000 educational colleagues for the nation’s premier event covering diabetes education. For companies in the diabetic product space, AADE provides an excellent opportunity to meet face-to-face with a variety of healthcare professionals, including doctors, registered nurses and dieticians, nurse practitioners and pharmacists, who can recommend diabetic products to their patients. Produced by the Academy of Nutrition and Dietetics, FNCE is the world's largest annual meeting of food and nutrition professionals, attracting thousands of attendees for four days of educational sessions, lectures, briefings, and culinary demonstrations. An unparalleled marketing opportunity for exhibitors, FNCE places their products in front of professionals that influence millions of consumers around the globe while providing an unmatched resource for gathering the latest information and innovations related to food, nutrition, and dietetics. Billed as “the world’s leading ingredient and solutions trade show, where science and strategy intersect,” Supply Side West features 14,000 ingredient buyers and 10,000 ingredients from suppliers in the animal nutrition, personal care, food, beverage and dietary supplement markets. Exhibitors have a unique opportunity to get up close and personal with key CPG manufacturers and decision-makers looking for innovative ingredients and services. They can also take advantage of a wide variety of sponsorship opportunities, including underwriting content-based programming, to position their companies as industry thought leaders. The Natural Products Expo is so popular they need to have two – one on the East Coast and one on the West Coast. Both bring together large gatherings of industry professionals for three days of education and browsing the latest in natural, organic, and healthy lifestyle products. Exhibitors can take advantage of the highly targeted audience to introduce new products, build brand awareness, interact with members of the trade and consumer press, build new business connections, and strengthen relationships with existing buyers, brokers, and distributors. The most important event of the year for the fresh industry, Fresh Summit connects 20,000 produce and floral experts, leaders, and decision-makers with more than a thousand exhibitors from 60 countries. It also offers a highly targeted marketing opportunity for fresh industry suppliers, with 75% of attendees directly influencing the purchasing process, 38% having final purchase decision authority, and 55% saying they plan to buy products or services they see at the show. Discover the newest products and latest innovations in specialty foods at the Winter Fancy Food Show. The largest specialty food trade event on the West Coast, WFFS attracts nearly 20,000 attendees and 1,500 exhibitors while showcasing more than 1,000 new products from specialty food’s top manufacturers. A leading trade event for seafood buyers in every market category, Seafood Expo North America attracts more than 20,000 seafood professionals looking for the latest in new products, equipment, and services. Attendees include interested buyers from retail, foodservice, and other business categories, with 79% saying they are involved in or influence purchasing decisions. The show’s Key Buyer Program also attracts more than 500 key buyers to the exposition, including high-volume seafood purchasers in multi-unit retail and food service establishments. Billed as “The Largest Pizza Show in the World,” Pizza Expo is the trade show for the pizza industry, bringing together pizzeria owners, operators, and managers, as well as distributors and food brokers from around the world. Closed to the general public, Pizza Expo provides exhibitors with a highly focused marketing opportunity to display new pizza-related products, generate qualified leads, and promote their businesses to industry decision-makers. Exhibitors can also select from a variety of affordable advertising and sponsorship opportunities to attract the attention of potential buyers. The catering and event industry’s largest B2B trade show celebrates its 25th anniversary with an inspiring event where industry professionals can sample new products, services, and techniques while networking with more than 7,000 of their colleagues from around the world. The show puts exhibitors directly in front of the $45 billion catering industry’s most influential buyers and trendsetters, who typically buy in large volume. Produced by the National Restaurant Association, the New England Food Show is a regional trade show that attracts more than 8,000 retail, food service, and restaurant operators looking to invest in the newest and best products and services. 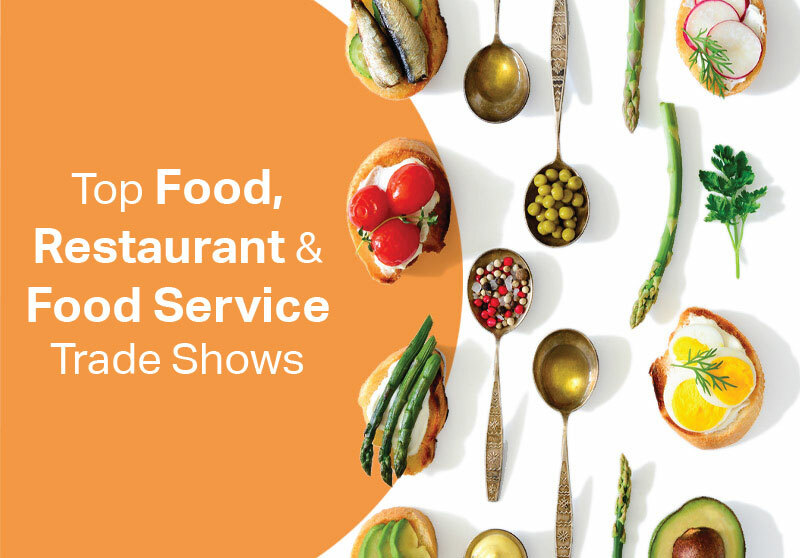 Open only to professionals directly involved in the food service or lodging industries, NEFS offers a powerful sales and marketing opportunity for exhibitors by providing a qualified audience with exceptional purchasing power. At the 2016 show, more than 8 out of 10 attendees planned on making a purchase as a result of attending. The only event in the New York region that exclusively serves the restaurant and food service industry, IRFFS showcases the latest and most dynamic innovations in food preparation, technology, equipment, and food service business education. The show provides exhibitors with a strategic forum to demonstrate their food products, equipment, and technology solutions to more than 16,000 industry professionals – half of whom do not attend any other food service, restaurant, or hospitality trade event. As the first major industry event on the East Coast in the calendar year, it also offers a unique opportunity for exhibitors to launch new products. The NRA Show is the annual trade show for the $700 billion restaurant industry, attracting more than 45,000 buyers from 110 countries and all 50 states for four days of meeting, seeing, tasting, testing, and more. Exhibitors have a rare opportunity to display their products, services, and solutions to 98 of the top 100 restaurant brands. Attendees bring an average equipment and supply budget of more than $5 million to the NRA Show, with most planning to spend $970,000 as a result of attending. Staged by the National Confectioners Association, the NCA Sweets & Snacks Expo gathers more than 16,000 industry professionals for the purpose of advancing the confectionery and snack categories through sales, product demonstrations, and networking. More than 700 exhibitors display four acres of candy and snacks while enjoying a unique opportunity to develop new leads for their sales pipelines. By entering the show’s Most Innovative New Product Awards, they can also have their new items taste-tested by some of the largest retailers in the world, including Wal-Mart, Safeway, Sam's Club, and Walgreens. The largest show in the world serving the dairy, deli, and bakery food service categories, the IDDBA Show brings together more than 9,000 industry professionals interested in browsing new products and services while expanding their industry networks. Targeting merchandisers and executives who share a passion for food and the industry, IDDBA pre-qualifies attendees to provide its nearly 2,000 exhibitors with a chance to interact with key buyers and decision-makers representing all segments of the industry. Owned and organized by the Food Processing Suppliers Association, Process Expo is one of the fastest-growing trade shows in the U.S., attracting the world’s most successful food and beverage processors, equipment manufacturers, and academic leaders from the top food science universities. With attendance growing every year, the show gives exhibitors a unique opportunity to identify qualified leads and generate new business at an economical price.